The Dutch AC Team – Team The Netherlands – presented their programme for the 36th America’s Cup at a press conference in Scheveningen, the team home base, on Wednesday. They confirmed Simeon Tienpont as skipper, Peter van Niekerk as team manager and that Dirk Kramers will lead the design team. Carolijn Brouwer, a member of the Volvo Race winning Dongfeng crew, is also on-board, and has hopes to be the Helm. The challenge is made under the Royal Netherlands Yacht Club Muiden and Royal Maas Yacht Club, and the boat is to be named Salamander, which apparently was the name of a successful warship from the wars against the British! Information still appears to be sparse, with details of the budget and the builder not revealed, but there will be some form of foiling test boat for training. 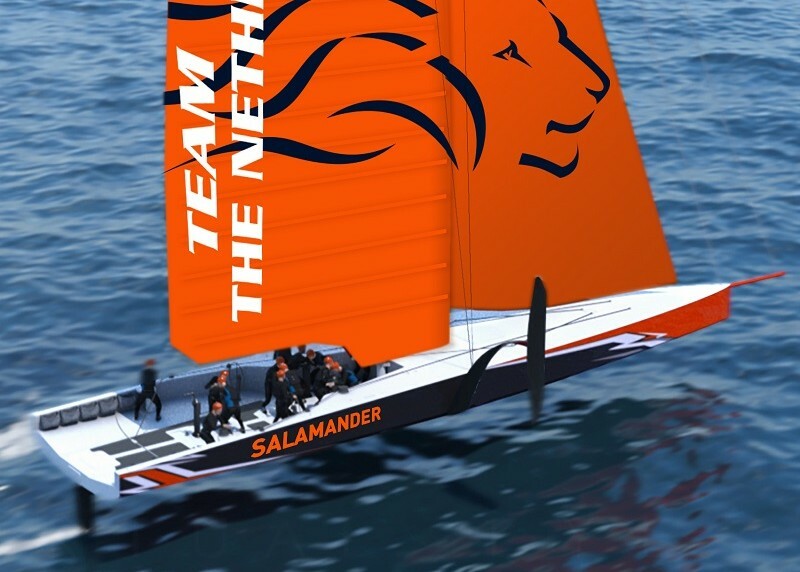 Although the Dutch have stated that one of the selection series in 2020 must be in Scheveningen, it is not known if this has been agreed by the New Zealand defender or the Challenger of Record, Luna Rossa. The Team The Netherlands (AKA Dutchsail) has a new website, but it contains little original information at this stage, except for a Timeline. This states that they will start construction of a Test Boat in March 2019 and launch their AC75, Salamander in March 2020. There is also a date for their proposed America’s Cup World Series event in Scheveningen in June 2020. But that still has to be agreed and it is not known at this time what other teams have scheduled. The Prada Cup is in Auckland scheduled for February 2021 followed by the AC36. Press Conference video here – In Dutch. RYA play it Close to their Chest . . .